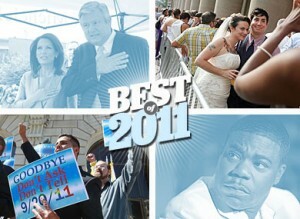 Check out The Advocate‘s list of the 21 top news stories of 2011. Pay special attention to numbers 10 and 18 (Tracy Morgan’s rant and the Bachmann clinic scandal) — Truth Wins Out broke both of them. In 2011, TWO also nixed Exodus International’s “ex-gay” Apple iPhone app, went on a 12 state university speaking tour in the Midwest and the South, offered original reporting from inside the belly of the beast (including the Values Voter Summit and The Call Detroit), took on “ex-gay” road shows in places such as West Virginia, Houston and Asheville, NC, and protested the Southern Baptist Convention. I know I’m speaking for Wayne, Evan, and myself when I say that I’m proud of the work we do at TWO and grateful to all of our supporters and contributors who make it possible. Thank you! Please consider an end-of-year tax-deductible contribution so we can continue our important work in 2012.